The Rockstar Energy Husqvarna Factory Racing team had a great night despite very challenging track conditions at the final round of AMA Supercross, held at Sam Boyd Stadium in Las Vegas, Nev. on Saturday. Rain plagued the night and turned the track into a muddy, slippery mess, making for a very eventful race as Jason Anderson finished second in 450 and teammates Zach Osborne and Martin Davalos finished second and 10th, respectively, in 250. Christophe Pourcel sat the night out due to injury. Jason Anderson was second at the start of his heat and held strong to the finish aboard his Husqvarna FC 450 to finish second and transfer to the main. In the main, Anderson was again second at the start, briefly occupied third after getting passed in the second lap only to reclaim the position about halfway through the race and take it to the finish. He finishes out the season third overall in 450 rider point standings. “My race was pretty good,” said Anderson. “My starts were also pretty good tonight. I stayed in it and was trying to catch Dungey for a minute but I ended up second. I feel like I had a good little rhythm through the whoops and that was helping me out a lot. I was pretty comfortable out there, but the lappers made it really tough when I got around them. All in all it was a pretty good finish to my sophomore season." The Las Vegas Supercross finale marks the convergence of both the 250SX East and 250SX West riders. Representing the West, Zach Osborne let the track conditions get the best of him in his heat and crashed early in the race. He was forced to earn his spot in the 250SX East-West Shootout via the 250 LCQ where he got the holeshot and finished second. He put on an excellent ride in the Shootout and impressively navigated his Husqvarna FC 250 from 11th to second despite a deteriorating track and a shortened main event due to track conditions. His second-place finish solidified his spot at fourth overall in 250SX West rider point standings. “Today had a great end result,” said Osborne. “I was third-fastest in practice before the rain came. The night show started pretty rough. I crashed in the first turn in the heat race and had to go to the LCQ. I didn’t fall in the first turn of the main but did get caught up in that little melee. I came from 17th to 2nd - 6 seconds out of the win. I’m pretty happy with how it went and I feel like I rode well. I’m looking forward to carrying this momentum into Hangtown." Martin Davalos represented the 250SX East class at Sam Boyd Stadium. He got a top-10 start in his heat and made it all the way up to third before going down and remounting farther back in the pack. He came back to finish eighth and earn a spot in the Shootout. He started in the back in the Shootout and was forced to deal with a mess of a track the entire race. He didn’t let the challenge phase him, however, as he pushed through the mud to take his Husqvarna FC 250 from 17th to 10th by the time the checkered flag waved. His top-10 finish puts him at fourth overall in 250SX East rider point standings. 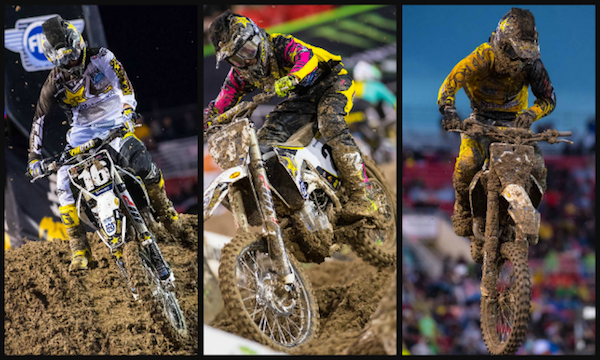 “This was a fun weekend,” said Davalos, “but it was definitely the toughest track of the year. It was really demanding and challenging. There was only one line. I was riding good in the heat race but made a mistake and crashed pretty hard. The main event was just survival. You couldn’t jump anything, there was only one line, and people were going down left and right. I’m just happy I’m healthy. I’ve had a pretty good season with two wins. I’m really excited about what’s to come, and I’m trying really hard to not stress out about tonight because it’s definitely something that I’ve never ridden."